Yay! Last instalment of the sewalong! We’re hemming our dress now, which is the last step. It’s oh so easy. The instructions tell you to press up 0.5cm on the bottom of the dress, stitch it in place, then fold again and stitch again. Go ahead and do just that if you like. Personally, I would favour a standard narrow hem over the method above – so, turn up 5/8″ (1.5cm) on the bottom of the dress and press, then fold the raw edge in towards the fold you just pressed, and press again, and then stitch. 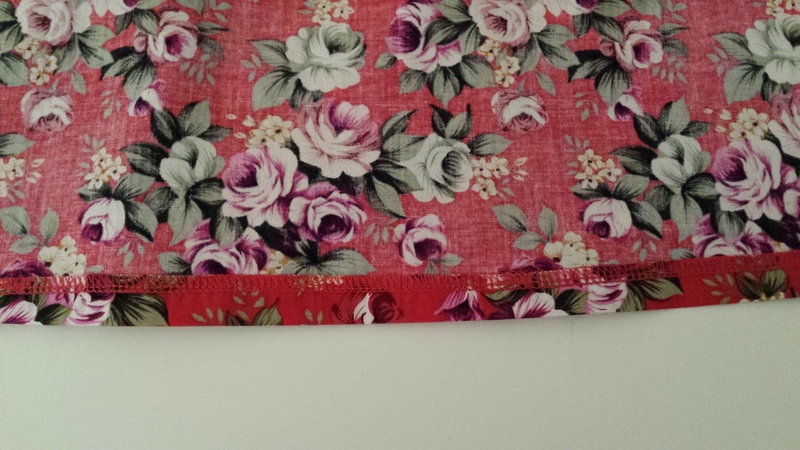 This uses half a centimetre more of length, but you only have to stitch once. However, what I actually did is I overlocked my raw edge, turned it up once, pressed it and sewed it. What can I say – my overlocker allows me to be lazy! Just one little thing left to do now: to help prevent your facing from popping out of the top of your dress, hand tack it down to the shoulder seam allowances – just a few quick hand stitches should suffice. And that’s it, you have finished making your very own Brigitte dress! Congratulations! I’m going to reveal my finished dress on Tuesday 20th May, and I’d love to show yours too! If you have a link to a photo of your finished dress, leave it in the comments below and I’ll see if I can include it in my reveal. If you don’t have your photo online somewhere, you could email it to me: thread.carefully@yahoo.com. I hope you are pleased with your dress and I hope I’ve been helpful to you. If you have any further questions about your dress, feel free to ask!